The International Hockey Federation (FIH) has confirmed six rule changes to Indoor Hockey which will come into effect at the start of 2016, including a return to six players on the pitch. The match between Germany and Austria was a milestone for Deon Nel as he umpired his 100th international senior match. 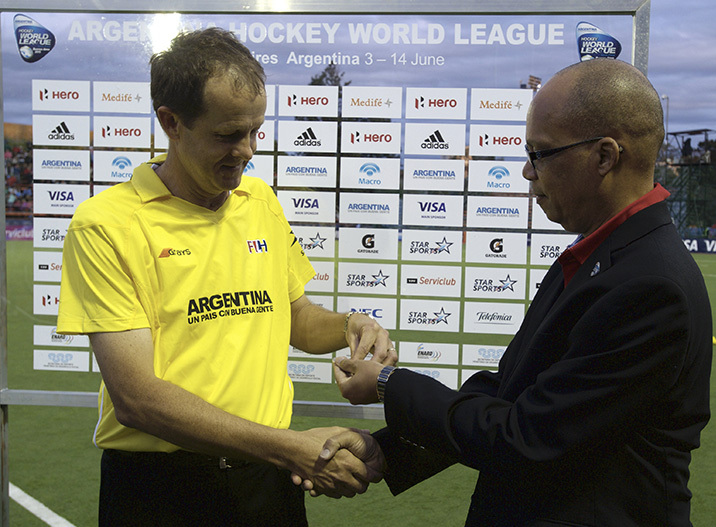 The South African becomes the 35th male umpire and the third South African after Marelise de Klerk* (2004) and John Wright (2006) to receive the Golden Whistle. Please find attached a brief description of the new 2015 Rules which will be applicable this season. Further information and clarity is provided in the 2015 Rule Book available on the FIH website and soon in hard copy (Rulebooks) from the SAHA offices. The 4 x 15minute quarters will only be applicable at IPT's, National and International tournaments. This is as a result of the additional time required. Adaptions to the mini hockey rules will be made an distributed shortly.